In 1928, the Committee of Fourteen, New York City’s leading private antivice organization, employed a black teacher to conduct a five-month undercover investigation of Harlem’s nightlife. It had been ten years since the committee had subjected the neighborhood to such intensive surveillance. 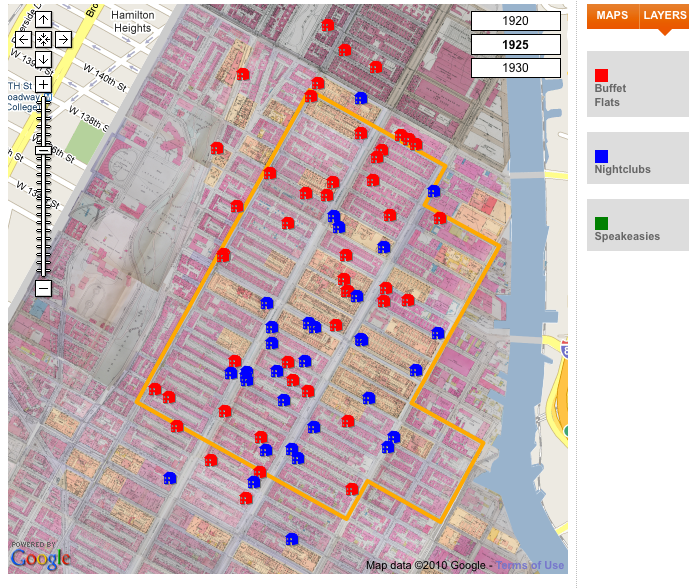 Typically explained as the result of racism, that neglect also reflected white investigators’ increasing inability to gather information in Harlem. 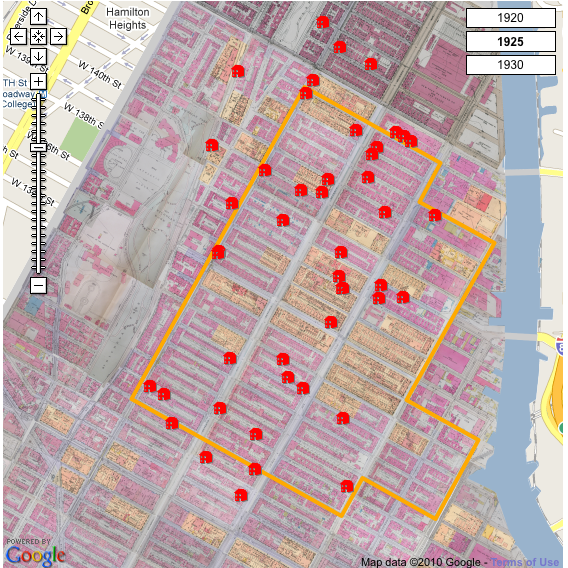 This article explores the work of investigators and the racial dynamics of undercover investigations to show how those difficulties grew from the congregation of waves of new black migrants in the neighborhood and, as Prohibition drew whites to Harlem, blacks’ retreat into private spaces, buffet flats, for their leisure. It uses the rich snapshot offered by the black investigator’s reports to reveal how, in the 1920s, black prostitutes, rather than being successfully regulated, blended into these new black spaces. 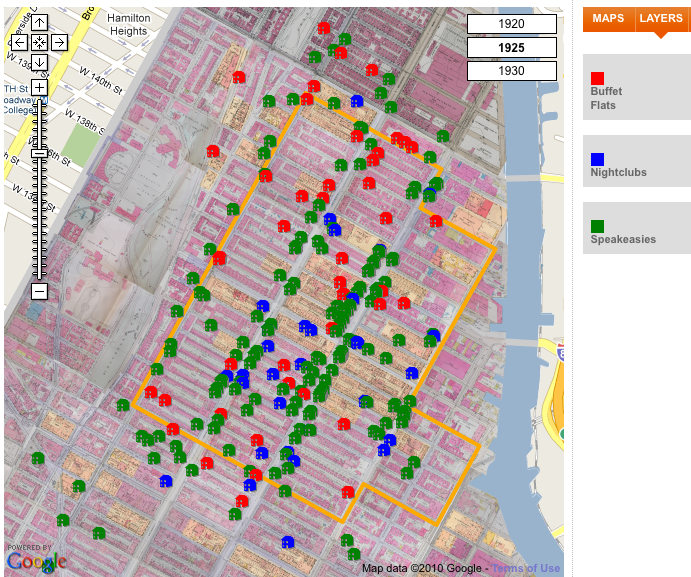 The article does not include maps, but the buffet flats that Claymes investigated, and nightclubs and speakeasies, are among the locations included in the ‘Digital Harlem’ database, so it is possible to generate maps of the spaces that it discusses. What is a buffet flat? An apartment that in the evening, and after nightclubs closed, operated as a venue offering alcohol, music, dancing, prostitutes, and, commonly, gambling, and, less often, rooms to which a couple could go. Their location in residential buildings offered a degree of protection from policing, and from whites: most proprietors and patrons of buffet flats were black. Rent parties have become the best known of the entertainments on offer in 1920s Harlem, but buffet flats were more widespread and more central to black nightlife. They did not charge admission, as the hosts of rent parties did, nor advertise widely, but they were ongoing concerns that offered privacy that parties did not. Your Harlem blog is one of the most exciting I’ve encountered! When I arrived in NYC in the early ’60’s from NW Ohio I rented a room on West 137th St. I was like a kid in a candy store. I couldn’t get enough of the still active nightlife and after hours clubs. I barely slept Thursday-Sunday. My experience was total immersion in American & Latin Jazz. What memories! Thank you for the historical road map. Please put me on your e-mail list. Thank you.